Atlanta, Dr. Sayeg stands at the forefront of advanced dental offerings that leads to proficient results. Dr. Sayeg has studied at best dental school in this court to provide quality and comprehensive treatment to his patients in Atlanta. 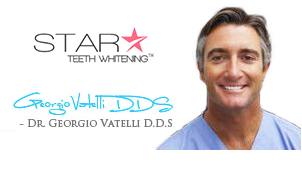 The quickest and safest way to whiten teeth today, cosmetic teeth whitening with the top dentist in Atlanta, Dr. Sayeg is the best to ask for. With this procedure, it will be possible for you to whiten your teeth color and enhance your smile within a few minutes. Dr. Sayeg offers safe solutions at competitive rates in Atlanta. You may have been happy with your teeth, but have you ever wished that your teeth were a bit small or more even. If so, cosmetic contouring can help you in achieving just that. You can now get even shape and size of teeth with this treatment. Ask Dr. Sayeg, the top dentist in Atlanta! Gummy smile is a common problem with most Americans. Gums often grow down in an uneven form to cover teeth, which gives you an unsymmetrical look. Gingival contouring is a simple procedure that can help in removing excessive gum tissues, to give you brilliant results. Having crooked, broken or chipped teeth is a common problem. Gaps between teeth can also be a cause of concern. All these cosmetic dental issues can be corrected with a procedure called dental bonding. It is a simple technique that uses high quality bonding material to be sculpted directly for correcting the surface of teeth. Bonding closes gas, lightens stains and changes the shape of misaligned teeth. The use of porcelain veneers has revolutionized the use of cosmetic treatments. People who weren’t born with a perfect smile can now have one. Veneers are thin covering that can be placed over the teeth to alter its length, shape, size and color. Teeth damaged by injury or decay can be corrected and restored with porcelain crowns. These are ceramic shells, custom fitted to bond with natural teeth. Bridge restoration is essential for missing teeth. It is a fixed method of restoration that can replace multiple missing teeth. A missing tooth can be surgically implanted with dental implants. These are anchored to the existing bone to give you permanent tooth.